Railpictures.ca - A.W.Mooney Photo: It seems odd that one of the cities most influenced by the railroads would shed its affiliation with them before most other communities. There were once 7 railroads radiating out of Lindsay. There were 5 stations, built on 4 different locations. Yet the last station was dismantled in 1963 and the last tracks were pulled up around 1992. All I could find in a visit back in 1977 was this CPR Freight Shed. I understand it was still in use in various capacity up until in the 2000s. It is now gone, and save for a few static displays and rail trails, everything else railroad is now history there as well. The sign board on this shed I understand to be salvaged from a CP station that once stood on this very spot. | Railpictures.ca – Canadian Railway Photography – photographie ferroviaire Canadienne. Copyright Notice: This image ©A.W.Mooney all rights reserved. Caption: It seems odd that one of the cities most influenced by the railroads would shed its affiliation with them before most other communities. There were once 7 railroads radiating out of Lindsay. There were 5 stations, built on 4 different locations. Yet the last station was dismantled in 1963 and the last tracks were pulled up around 1992. 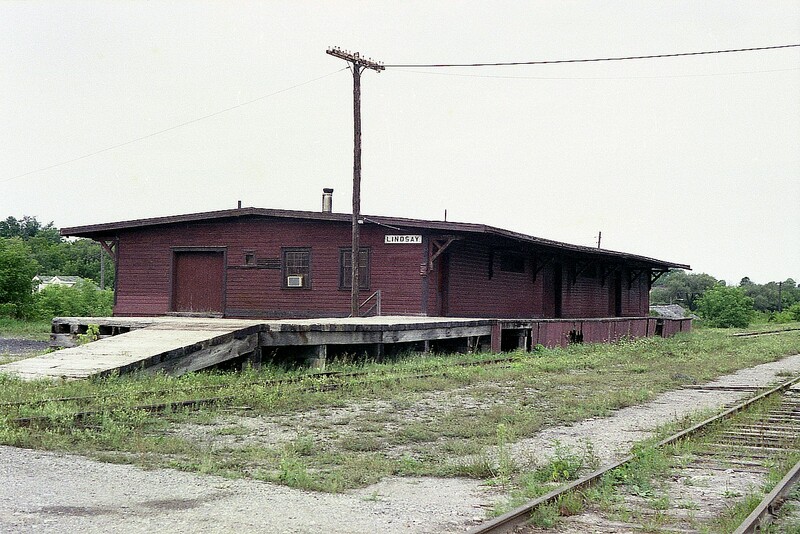 All I could find in a visit back in 1977 was this CPR Freight Shed. I understand it was still in use in various capacity up until in the 2000s. It is now gone, and save for a few static displays and rail trails, everything else railroad is now history there as well. The sign board on this shed I understand to be salvaged from a CP station that once stood on this very spot.